The universe is full of galaxies. Many of the galaxies visible in small telescopes are included in Charles Messier's list of non-stellar objects. How many galaxies have we actually imaged? The Hubble Deep Field project can give you some idea. 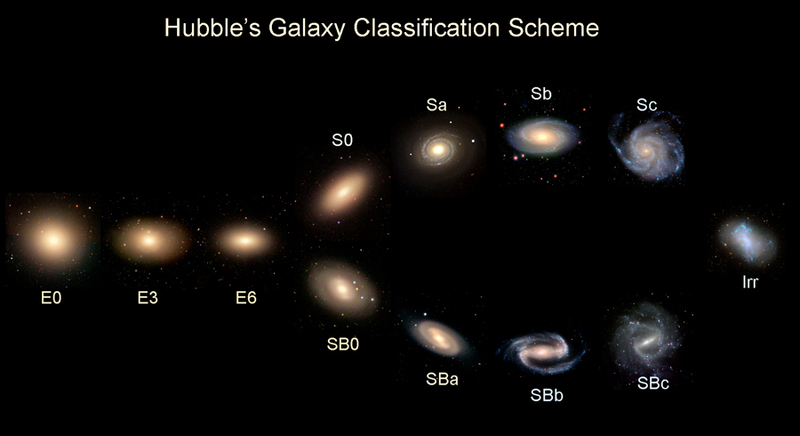 Early in the twentieth century, Edwin Hubble sought to create a system to classify the galaxies. He came up with essentially three different categories; Spirals, such as the Milky Way, Ellipticals, both giant and dwarf, and Irregulars. Every galaxy we see can fit into one of those categories. The largest structures in the universe come in only a few basic types! You will note that many of the galaxies we talk about have catalog names that begin with NGC. What does NGC stand for?